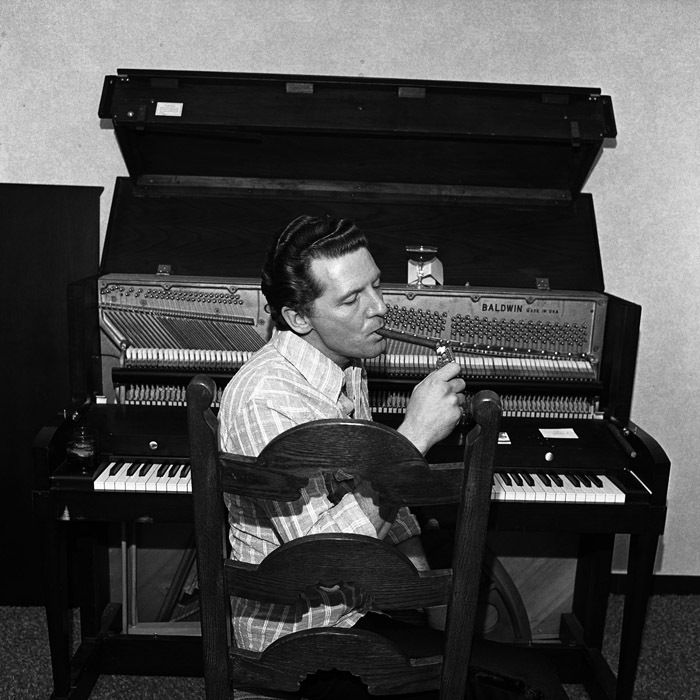 Here’s my review of Henry Horenstein’s photo exhibit “Honky Tonk: Portraits of Country Music 1972-1981” at the RISD Museum. 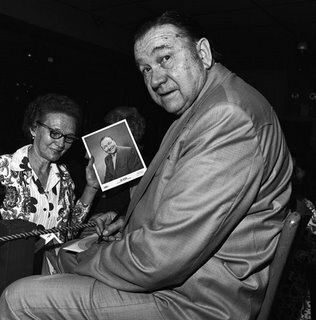 Among the 39 photos are cool shots of Jerry Lee Lewis (pictured at top), Dolly Parton, Waylon Jennings, Emmylou Harris, Loretta Lynn, Bill Monroe, Porter Wagoner, Mother Maybelle Carter and Tex Ritter (pictured below). Most are shot backstage or in parking lots; there are few performance scenes. Many of the photos began their lives as quick news shoots or album and promotional art. These images are fun as a hall of fame and a nostalgia trip of bouffant hairdos, bushy sideburns, polyester clothes and big cars. 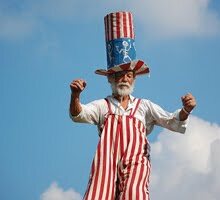 But most are more interesting for whom they show than their artistry. Horenstein, a 59-year-old Boston resident and photography professor at RISD, also spent time at the Grand Ole Opry in Nashville, seedy honky tonk taverns, country music parks and bluegrass festivals. The best of these slice-of-country-music-life pictures speak of people seeking a good time amidst hardscrabble circumstances. Inspired by Diane Arbus photos from the ‘60s and Walker Evans’ Depression-era shots, Horenstein shot in a blunt, gritty documentary style with his medium-format Rolleiflex. In retrospect, the ‘70s was a highwater mark for modernist photography. The work of photographers like Edward Weston, Ansel Adams and Aaron Siskind, which emphasized the formal and abstract qualities of photos, was finally beginning to be accepted as art by museums. Arbus, Lee Friedlander and Garry Winogrand’s documentary photos were getting attention. 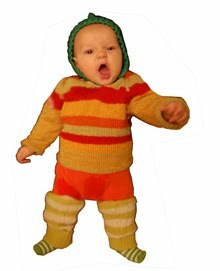 Then postmodernism spawned the deadpan, dour, posed, increasingly artificial photography that has come to dominate the form today. In art photography these days, no one seems to be having much fun. So it’s notable that in the “Honky Tonk” catalogue, the ratio of people smiling to people not smiling is about 50-50. In the RISD exhibition, though, non-smilers outnumber smilers by 2 to 1 resulting in a harder tone. I suspect this is because the book is geared toward country music fans, while the exhibition is designed to showcase Horenstein’s artistic bonafides. 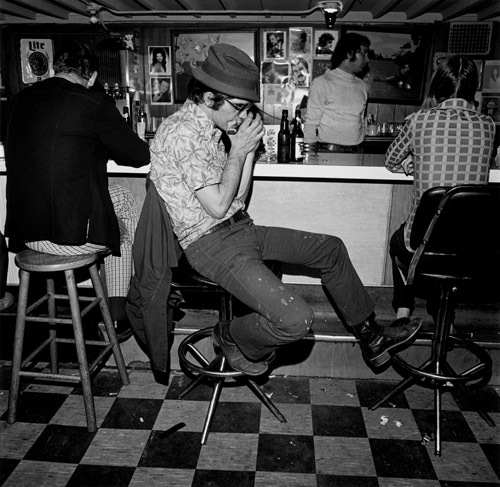 Henry Horenstein, “Honky Tonk,” RISD Museum, 224 Benefit St., Providence, June 29 to Oct. 7, 2007. Pictured from top to bottom: “Jerry Lee Lewis, Ramada Inn, Boston, Massachusetts,” 1975; “Tex Ritter, Hillbilly Ranch, Boston, Massachusetts,” 1973; and “Harmonica player, Merchant’s Cafe, Nashville, Tennessee,” 1974. All copyright 2003 Henry Horenstein. Located at the Green Street Orange Line T station, Axiom Gallery has been “metaphorically transformed into a biological cell that feeds off the sounds and electromagnetic fields of passing MBTA trains.” At least, that’s what the Axiom Web site tells me about its new collaborative installation, “Endosymbiont” (a fancy word for a creature that lives symbiotically within its host), by Jerel Dye, Jake Lee High, Sean O’Brien, and Fred Wolflink. 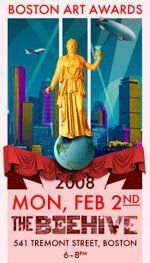 Don’t be distracted by the hifalutin lingo — what we have here is a funhouse. And it’s worth a visit. The perimeter of the gallery has been curtained in reflective mylar. Inside, it’s dark. 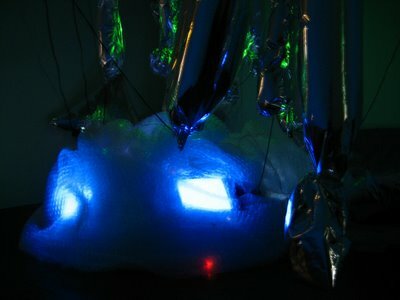 In one chamber (pictured at top), sausage-shaped mylar balloons dangle above blinking computer monitors covered in bubble wrap. Sensors triggered by the movement of gallery visitors and trains rumbling underground cause the balloons to inflate and deflate like living organisms (think: the most manly part of a man’s physique) and make a crinkly noise. In the next room (pictured above), a pair of sausage balloons hang from the ceiling, and two big inflated plastic bags slouch on the floor. 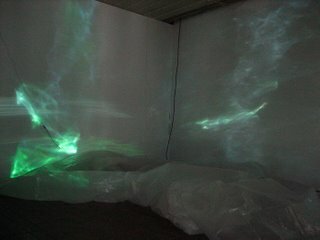 Light from a pair of projectors reflects off the mylar curtain, projecting jittery, watery green-and-white waves on the gallery wall. Bells, electronic buzzing, low metallic rumbles, and dings make you feel as if you were in an underwater space-alien lair. “Endosymbiont,” Axiom, 141 Green St., Jamaica Plain, June 7 to July 15, 2007. Clifford Still pioneered this trend, telling [his dealer] Betty Parsons on the occasion of his exhibit in 1947 that titles “would inevitably mislead the spectator, and delimit the meanings and implications latent in the works.” Rothko followed suit the next year and Pollock in 1949. Whereas [Barnett] Newman had provided titles for some of the works he made in 1946 and 1947, by the time he was painting in 1948 and 1949 the practice was passé. Titles for the paintings in his first exhibition [1950 solo show at Betty Parsons Gallery] would not materialize until several years later. – Ann Temkin of New York’s Museum of Modern Art in her 2002 book “Barnett Newman,” which was published by Yale University Press. 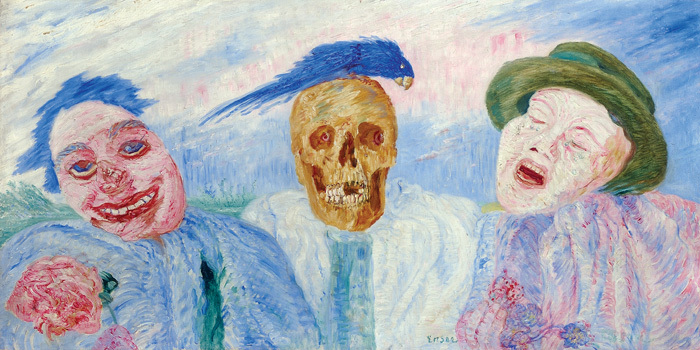 The best thing about “A New Key: Modern Belgian Art from the Simon Collection,” a mixed bag of an exhibition at Boston College’s McMullen Museum of Art, is that it offers a chance to see four paintings by James Ensor, the oddball Belgian master whose work is rarely seen around these parts. There are a pair of still-lives, one is particularly fine, and two of his acid, psychological, humorous scenes (including “From Laughter to Tears” of 1908, reproduced above), which are just okay. But any chance to see Ensor’s work in the flesh is welcome. 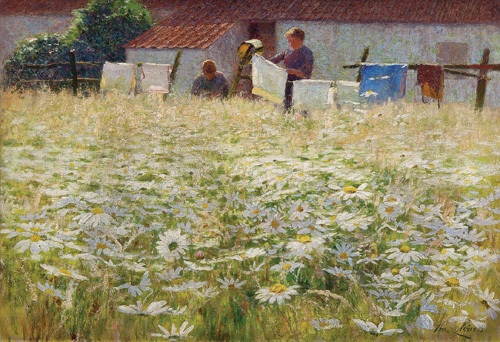 For this exhibit, which I review here, BC professor Jeffery Howe gathers 53 Belgian works made between 1889 and 1946 from the Simon collection, which is based in Britain and France. The show provides an overview of Belgian modernism and argues that the country was “an indispensable font of expressionism and surrealism.” There are artists familiar from the usual textbook histories – the surrealists Rene Magritte and Paul Delvaux, and the impressionist Theo van Rysselberghe. 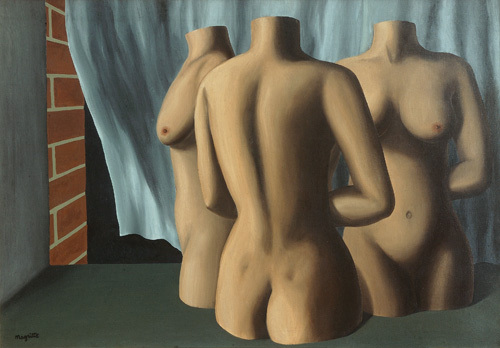 But Magritte is represented by a particularly mediocre work, “Dialogue Raveled by the Wind” from 1928 (reproduced above). 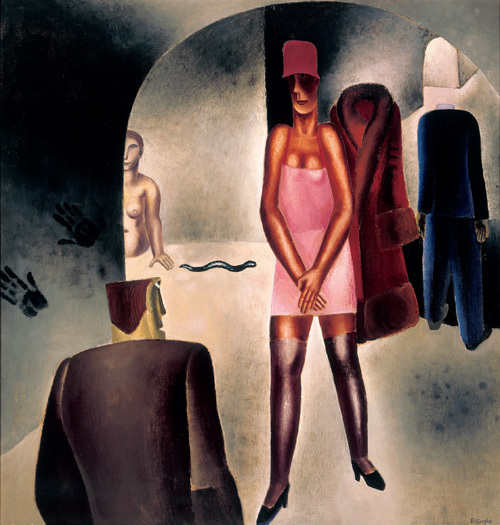 Frits van den Berghe charms with work that is by turns surreal (like his 1927 canvas “Corridors,” at left) and expressionist, and could fit in well with contemporaneous paintings by German expressionists. 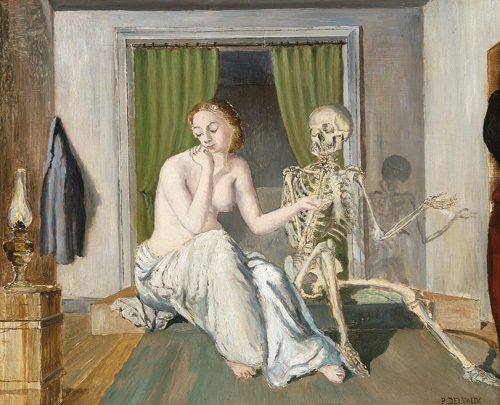 His seven paintings here remind me a bit of Otto Dix’s style right after World War I. And check out Valerius de Saedeleer’s terrific 1925 painting “Old Orchard in Winter,” which has some resemblance to paintings by the 16th century Belgian master Pieter Bruegel the Elder. Under a deep blanket of snow, a village has fallen into a mesmerizing dreamy calm, save for black trees with creeping limbs that seem like monsters from a Grimm’s fairy tale. 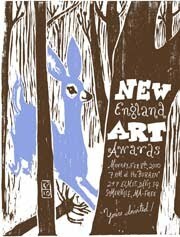 “A New Key,” McMullen Museum of Art, Boston College, 140 Commonwealth Ave., Chestnut Hill, Feb. 10 to July 22, 2007. Reproduced from top to bottom: James Ensor, “From Laughter to Tears,” 1908; René Magritte, “Dialogue Raveled by the Wind,” 1928; Frits Van den Berghe, “Corridors,” 1927; Emile Claus, “Daisies,” 1897; and Paul Delvaux, “The Conversation,” 1944. All from the Simon Collection. © 2006 Artists Rights Society (ARS), New York/SABAM, Brussels.